The Schönberg (Vogtland region) – Schleiz branch line has been connecting Saxony and Thuringia since 1887. Regular passenger traffic was offered until 2006. 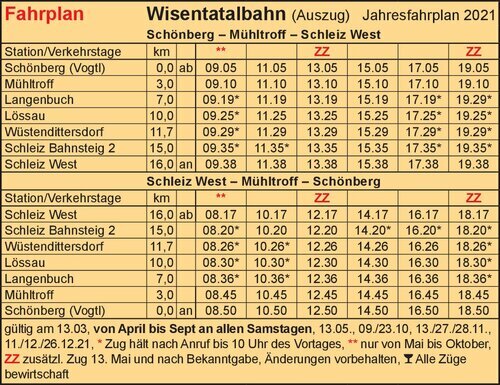 In cooperation between the Wisentatalbahn railway support association and Deutsche Regionaleisenbahn (the private railway company in Germany), the entire route reopened as a public passenger railway on 3rd December 2011. 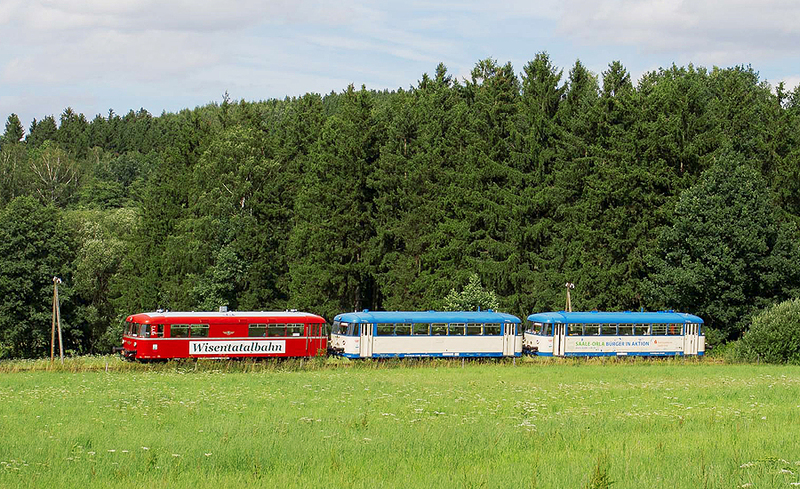 Since then, excursion trains, for example the historic railcars (LVT) of Eisenbahnnostalgie Vogtland, have been operating on the scenic route through the Wisenta valley. Today, the Oberland cycle path on the former narrow gauge route to the town of Saalburg leads to the Bleiloch dam. The Oberland omnibus service provides connections from Schleiz West Station to the Wisentatalbahn railway for passengers going to Burgk Castle and Saalburg at the "Thuringian Sea".